Growing up on the coast, we would eat a lot of fish. Cod, halibut or plaice were often served for lunch at school, or dinner at home. These light and flavorful fish are excellent choices for the British classic, Fish and Chips too. Salmon, however, was always a treat. Every time the family would get together, my grandmother would perfectly poach a salmon. It would sit in the center of the table, surrounded by everyone’s favorite side dishes, and be served perfectly on a fish-shaped plate. These days, we live in the Mid-west and almost all the fish we can buy is flash frozen and shipped to the stores. Gone are the days of walking down to the fish market, smelling the salty sea air, and shopping for fresh fish. Either I stock up on salmon every time I am lucky enough to visit Seattle, or I can order salmon from KOL Foods. #seattle #sunset with fellow #mozcon peeps. 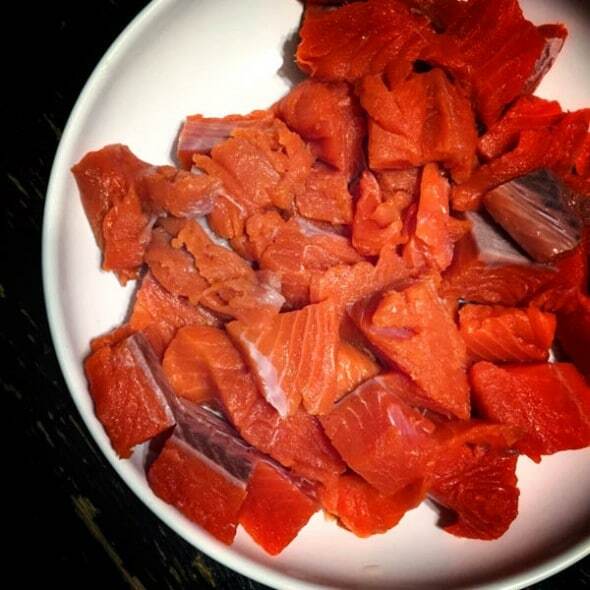 When you order salmon from KOL Foods, your fish will have a vibrant pink color. Before you even open the packagin, you can tell this is a high quality piece of fish. KOL Foods take immense pride and care in selling organic, grass fed meat, fish and poultry and this salmon is held to a similarly high standard. Freshwater salmon are free to find nutrition from plankton or other small fish which provide them with the nutrients they need to stay healthy. Farm-raised salmon, the cheap frozen stuff from the grocery store, is fed a diet of corn or soybeans which leads to larger, malnourished fish. The beautiful color of an organic salmon is the sign of a healthy fish — not one that has been pumped with red food dyes to appear pink before hitting the stores. I wanted to do something different with this beautiful fish and as I thought of the family get-togethers and growing up in the UK, I decided to try something completely new. Salmon curry. This is a super easy recipe, ready to serve in less than 30 minutes and it shouldn’t require you to run to the store to pick up any special ingredients. One of the secrets to making great curry is to toast the spices you’re using before adding them to any of the other ingredients. This really releases the spice and the flavor, plus your kitchen will smell amazing! 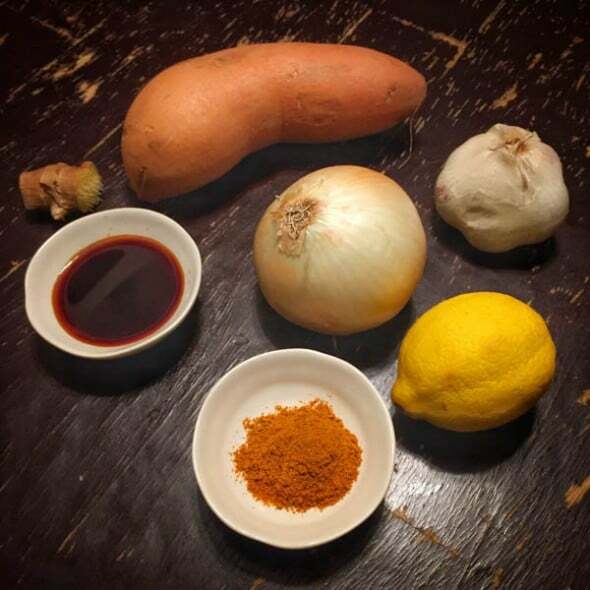 Hat tip to Detoxinista for inspiring this recipe. 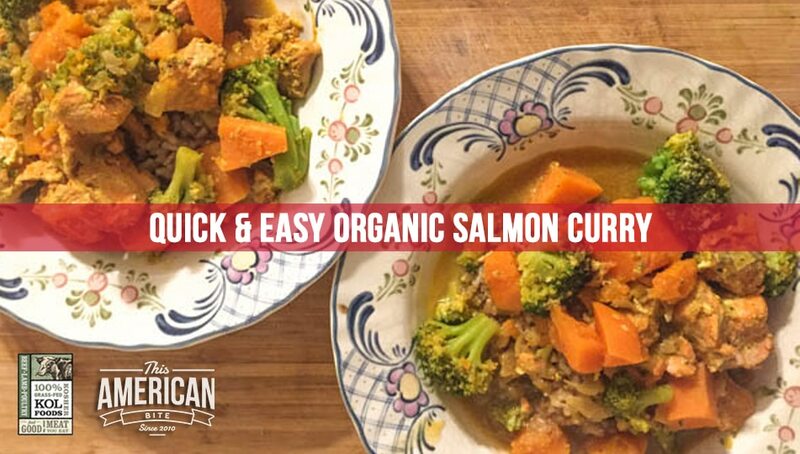 Check out her easy salmon curry too! Melt the coconut oil in the bottom of a thick bottomed pot (I used a Le Creuset Braiser). Once the coconut oil has melted and the skillet is warm, add the diced onions. 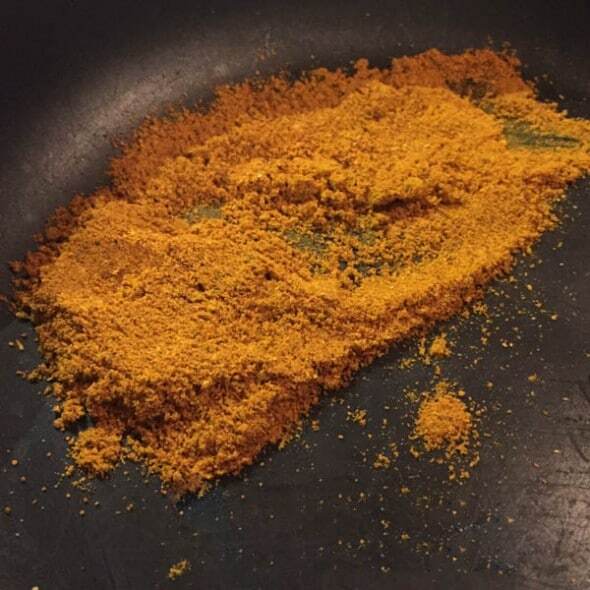 In a separate skillet, lightly toast your curry powder (no oil, put the spices in a dry skillet on a medium heat) for five to eight minutes. Once you can really smell the aroma of the curry powder, it’s time to remove it from the heat so it doesn’t burn. Add the toasted curry powder to the onions. Add the garlic, minced ginger and diced sweet potato. Let this cook for about 15 minutes or until the sweet potatoes are almost cooked. Allow these ingredients to cook while you remove the skin from the salmon, then cut the fish into 1 inch cubes. Season with a touch of salt (optional) then add to the skillet. Now combine the coconut milk, liquid aminos with the turmeric, and paprika. Stir once then pour over the rest of the ingredients. Stir, then cover and allow the curry to simmer for about eight minutes, until the salmon is cooked. Add the broccoli and stir again. Set a timer, otherwise you’ll overcook the salmon and rather than being fresh and delicious, it will be flavorless and dry.